There are a few coffee old-fashioned recipes out there. Unfortunately, many are subpar in today's culture of superior coffee drinks. Why would you use instant coffee when there's fresh espresso and quality beans around? That is why you'll enjoy with this recipe which is a bourbon and coffee lover's delight. This improved version of the coffee old-fashioned can be found in Stew Ellington's "901 Very Good Cocktails", a book filled with wonderful modern and classic drink recipes. The recipe uses espresso and adds crème de cacao to the mix for a touch of chocolate. Both of these are a fantastic match with almost any bourbon you choose to pour. With the hint of orange bitters, the drink comes to life as a multidimensional taste sensation you're sure to enjoy. Better yet, there's no muddling as is customary in old-fashioned recipes, so it's an easy drink that anyone can mix up. In a cocktail shaker filled with ice cubes, pour all of the ingredients. To slow down the dilution of this drink, serve it over an ice ball or similar large chunk of ice. Simple syrup is easy to make at home, an option that can save you money on this essential mixer. All you need is sugar, water, and a saucepan! Crème de cacao is available in both dark and white (clear) varieties. Either can be used in this recipe without altering the taste. If fresh espresso is beyond your capabilities, you can substitute regular coffee, though make it as strong as possible. In this instance, use 2 1/2 ounces of coffee to take over both the espresso and water in the recipe. A good cup of espresso can be made without a big machine; the moka pot is a great alternative. You can also use pour-over brewers, the Aeropress, a French press or any other coffee maker that produces a richer cup of coffee than the standard drip machine. With any of these, there's no need to add water, either. 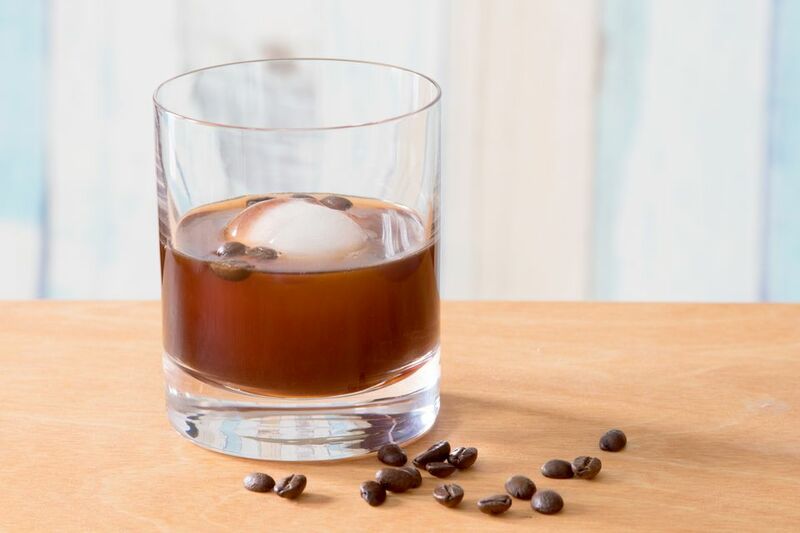 Since this is a cold coffee cocktail, you might even start with a cold brew coffee. It's incredibly easy to make at home and produces a very flavorful coffee. Just be sure to start it early because it needs to steep for at least 12 hours. How Strong Is the Coffee Old-Fashioned? The coffee old-fashioned is a nice, relaxing cocktail that has a relatively low alcohol content. When made with an 80-proof whiskey, you can expect it to be around 13 percent ABV (26 proof). It's almost like drinking a glass of wine, which is why it's a fantastic after-dinner drink. How Much is Starbucks Coffee in Countries Around the World?